Swingin La Vida Loca - fun, lively performers available for corporate events, conferences, weddings, parties and charity fundraisers. Lovegrove Entertainment, Australia. 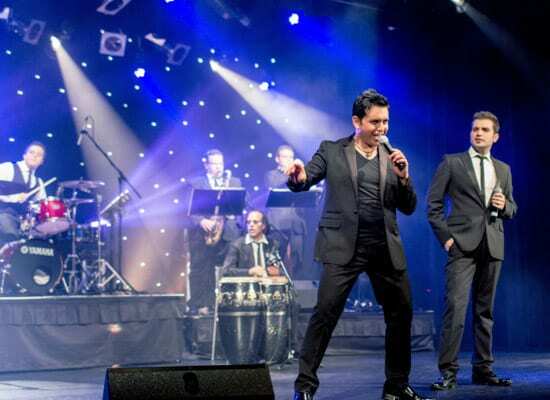 Imagine two of Australia’s most renowned Michael Bublé and Ricky Martin tribute shows being ‘accidentally’ double booked…at YOUR event! This is the build up of a highly interactive and entertaining performance your audience is going to love! Featuring five exciting artists and performers, this show exhibits what would happen when the world of latin pop collides with the kings of swing and an amazonian goddess from Brazil. Tunes include Samba, Salsa, Swing, Jazz and contemporary hits from Ricky Martin and Michael Bublé to Sergio Mendes, celebrating hit after hit from the Kings of Latin Party anthems to the King of Swing. This spectacular show will have your guests enthralled, engaged, entertained and wanting for more. Although ‘Swingin La Vida Loca’ can be performed to a backing track, we recommend the show with the full backing of The Love Groovers. Not only will they support the act in full costume, but they can stay on after the show and be your party band all night long, covering any style or genre of your choice, from latino to disco to top 40 hits. “A great new idea performed by very talented singers and dancers. Clearly, the crowd was totally into it. Just superb,” – Steve Spillane, Huntly Properties.